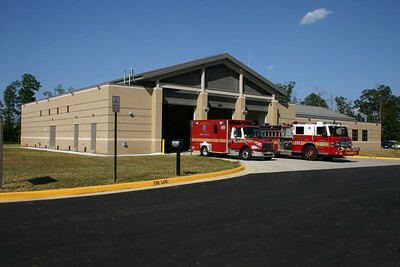 The new Fire Station 23 opened on July 7, 2011 in the Moorefield area on Old Ryan Road. The front of the station faces the Dulles Greenway toll road. What appears to be a hose tower with "23" (sorry about the sun spot) is actually for decoration only. Although this is the front of the station, the primary responding apparatus run out of the back bay (see next photograph). Running out of these bays are Tanker 623, Mobile Air Unit 623, and the Medical Ambulance Bus, MAB 623. The rear bays of Fire Station 23 have quicker access to the exit of the station. As a result, the engine and two EMS units run from the back of the station. 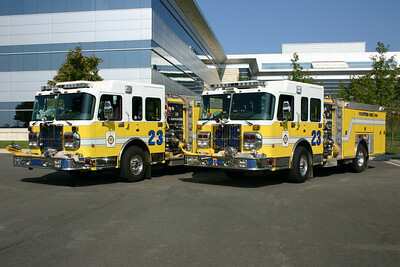 Shown in this photograph is Engine 623, a 2009 Pierce Velocity and Medic 623-2, a 2005 Freightliner M2/2006 Medic Master. Old Fire Station 23 in Ashburn-Moorefield, also known as the "Warehouse". 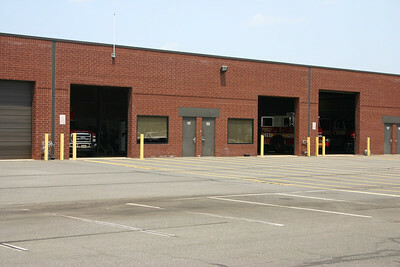 Station 23 moved to a new facility in July of 2011 and the warehouse is now used to house apparatus from the Fire Marshall's office as well as other miscellaneous trucks. Loudoun County's Engine 623 from the Moorefield Station - a 2017 Pierce Velocity 1500/750/50 and Pierce job number 30930-03. Originally scheduled to be delivered to Station 27, it was re-assigned to Station 23 as a result of the delayed opening of Fire Station 27. One of three ordered - the other two went to Engine 604 (Round Hill) and Engine 605 (Hamilton). Engine 623 as photographed in August of 2014. Dressed up with new wheel covers, headlights, etc. Now a reserve engine. 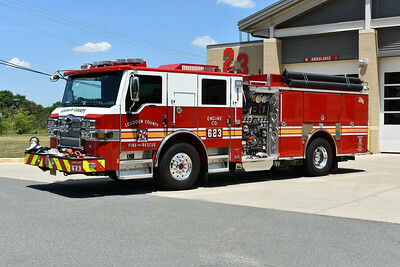 Engine 623 as photographed on the ramp of the new Fire Station 23 in Moorefield. 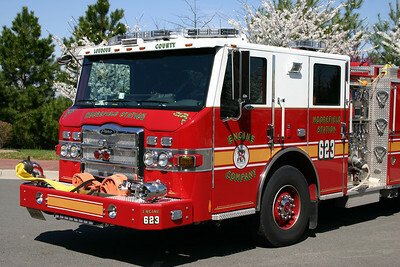 This photograph of Engine 623 shows the Federal Q siren on the front bumper. For a period of time, Engine 623 was equipped with a unusual "Super Chief" siren, which has a very distinct sound (see the other photograph of Engine 623). That siren was removed and a more traditional Federal Q added. 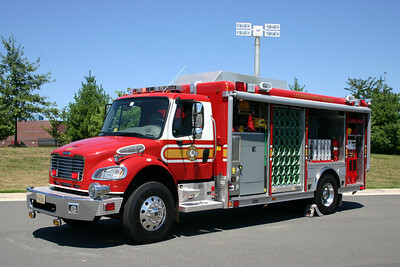 Engine 623 is a 2009 Pierce Velocity 1500/500 and 50 gallons of foam. 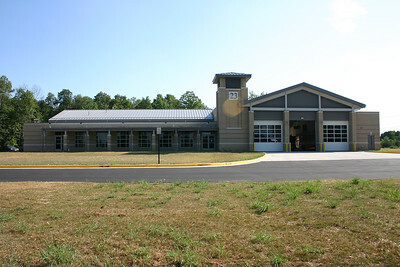 Moorefield Station 23 opened in 2004 as a combination effort between the Ashburn volunteers and Loudoun County. 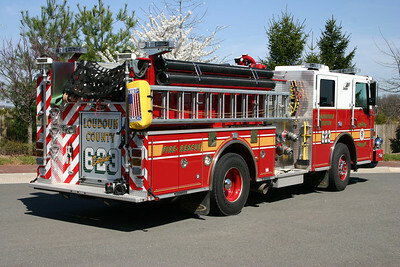 Originally a combination of volunteer owned apparatus and county owned apparatus operated from Fire Station 23. 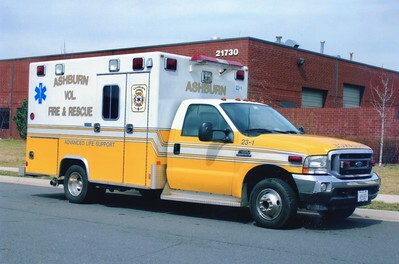 In 2009, Fire Station 23 became a county owned facility with the Ashburn owned apparatus being transferred to Fire Station 22 in Lansdowne. When the station became fully county operated in 2009, Engine 623 used reserve apparatus until the delivery of the new Engine 623. The new engine was this 2009 Pierce Velocity 1500/650/50. 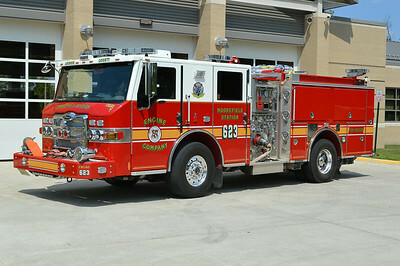 When the new Engine 623 was delivered in 2009, it came equipped with an unusual "Super Chief" siren instead of the popular Federal Q siren on the front bumper. The Super Chief siren was later replaced with a Federal Q. The back end of Engine 623. 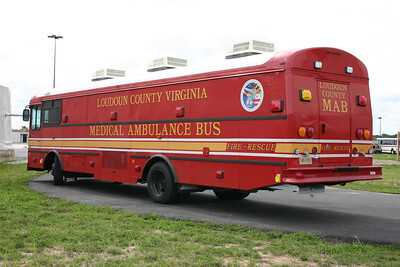 As part of another grant, a group of Washington D.C. metropolitan area fire departments received large Medical Ambulance Buses for mass casualty incidents. Seven were delivered - Loudoun County, Arlington County, Fairfax County, Washington D.C., Montgomery County, MD (2), and Prince George's County, Maryland. 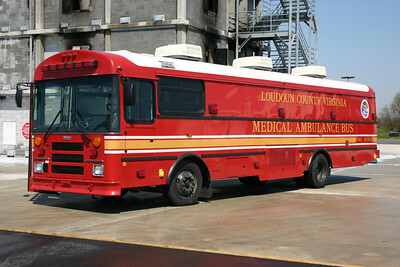 Loudoun's Medical Ambulance Bus (MAB) was originally kept at the Training Center and then transferred to Station 23 in 2009. It is a 2007 Thomas Built Bus outfitted by Sarton Services. This photograph was taken next to the burn building at the Training Center shortly after being placed into service. 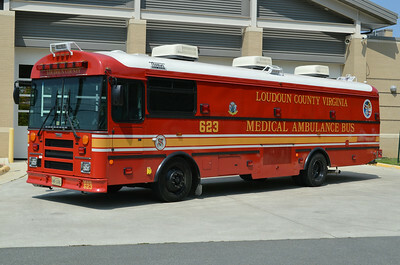 Another view of the MAB as photographed at the Loudoun County Training Center. The MAB can transport up to 20 stretchered patients. 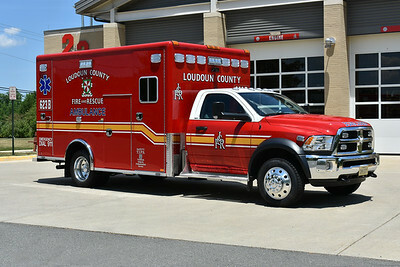 Loudoun County, Virginia took delivery of three 2018 Dodge 4500 4x4/Horton 603F and assigned them to Medic 623, 623B, and an eventual assignment to Station 27. Medic 623 has Horton serial number 18488. 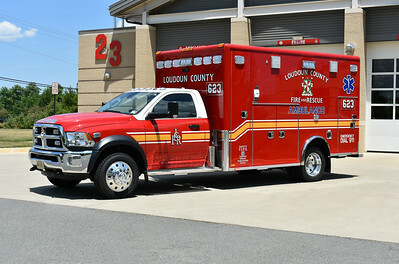 Loudoun County, Virginia took delivery of three 2018 Dodge 4500 4x4/Horton 603F and assigned them to Medic 623, 623B, and an eventual assignment to Station 27. Medic 623B has Horton serial number 18487. 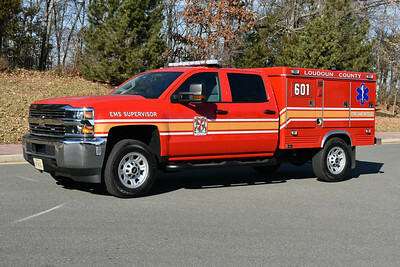 Loudoun County EMS 601 is a 2016 Chevrolet 3500 4x4/Swab. 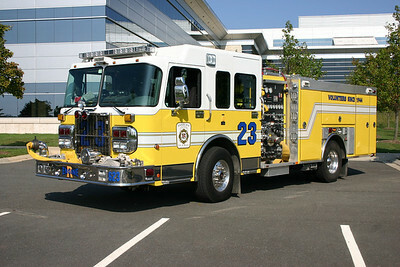 This truck operates from Station 23 in Ashburn. 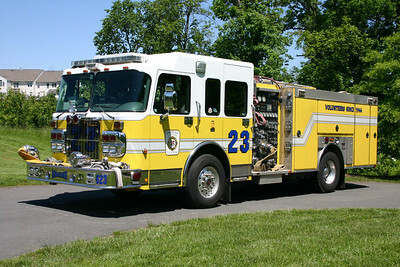 The original Engine 23 was this 2003 Spartan Gladiator/Ferrara 1500/500/20. It is now assigned to Engine 622. 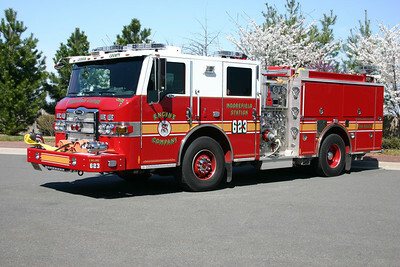 Another photograph of Engine 623, a 2005 Spartan Gladiator/Ferrara 1500/500/20. This photograph was taken at the original Fire Station 23, a "warehouse" type of facility in the Moorefield area of Ashburn. The original Engine 623 when the county took over operations at the station in 2009 was this 2002 Pierce Enforcer 1250/750. It was originally assigned to the Training Center, then re-assigned to Engine 16 in Neersville, and became a county reserve engine. 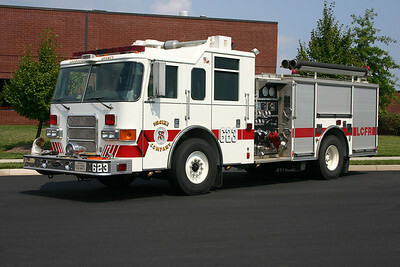 Once the new Engine 623 (2009 Pierce Velocity) was delivered, this 2002 Pierce returned to the reserve pool as Engine 699. 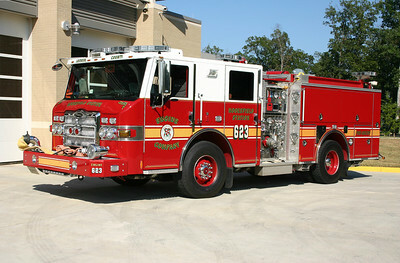 Reserve Engine 623 was a 2005 Spartan Gladiator built by Ferrara and equipped with a 1500/500/20. 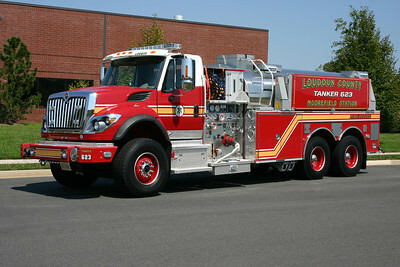 It now runs as Reserve Engine 622 in Lansdowne. This photograph was taken at the Ashburn/Ferrara photo shoot at a large facility off of Loudoun County Parkway. Old Engine 23 and Reserve Engine 23 were photographed together back in 2005 when the department photographed all of the Ferrara fire trucks (4 engines and a tower) for a Ferrara calendar shoot. Tanker 623 at Moorefield-Ashburn is a 2009 International 7600/Pierce equipped with a 3000 gallon tank and a 1500 gpm pump. It was delivered along with Tanker 605 in Hamilton, which was painted black and red. 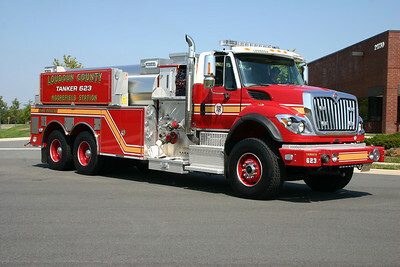 This photograph of Tanker 623 appeared in the November/December 2010 edition of Fire Apparatus Journal. Re-assigned to Tanker 609 in 2017. The officer side of Tanker 623. Tanker 623 has two 2100 gallon folding tanks stored on each side. Re-assigned to Tanker 609 in 2017. 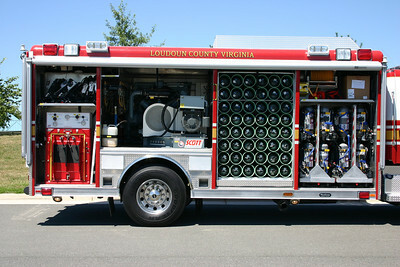 Loudoun County received one of eight Mobile Air Units delivered to Washington D.C. metropolitan area fire departments in 2005. 9/11 grant money provided funding for these trucks, all built on 2005 Freightliner M2 106 chassis with Hackney bodies. In addition to the large air compressors, the Mobile Air Units have three filling stations, carry 100 SCBA bottles, spare packs, 19' light tower, and a 75kw generator. 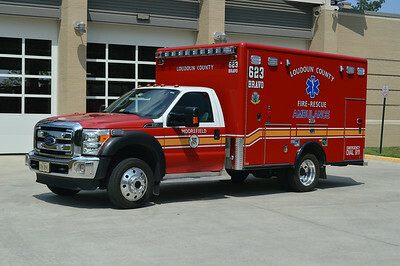 Loudoun County assigned its Mobile Air Unit to Station 23. I late 2015, the Mobile Air Unit was re-assigned to FS 8 in Philomont. 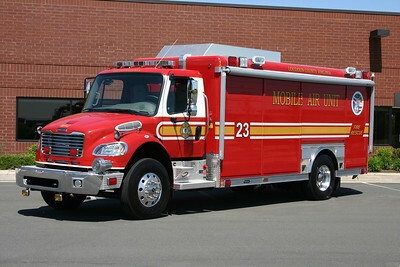 Another view of Mobile Air Unit 623, now MAU 608. Compartment doors rolled up and the light tower partially up on Mobile Air Unit 623. From left to right, filling station, air compressor, spare bottles, and spare SCBA's. 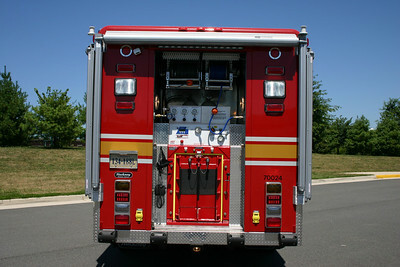 The back end of Mobile Air Unit 623 showing a filling station and air cord reels. In addition, awnings are equipped on both sides and the rear. 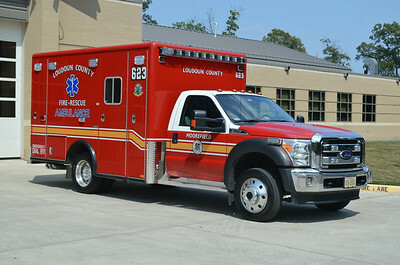 Medic 623 is a 2013 Ford F450 4x4/Horton. One of seven similar units purchased by the county. Moved to reserve status. 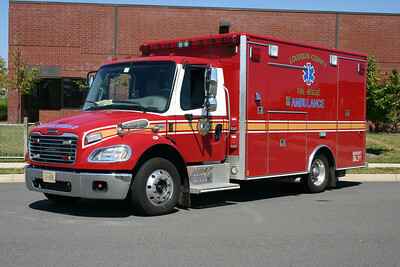 Ambulance 623B is also a 2013 Ford F450 4x4/Horton. Moved to reserve status. The former ambulances assigned to Station 23 were similar 2005 Freightliner M2/2006 Medic Master's. 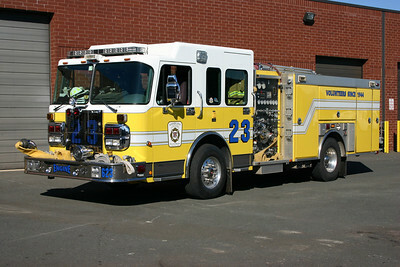 Old 23-2 is a 2008 Ford F450 4x4/Excellance now assigned to Fire Station 22 in Lansdowne. 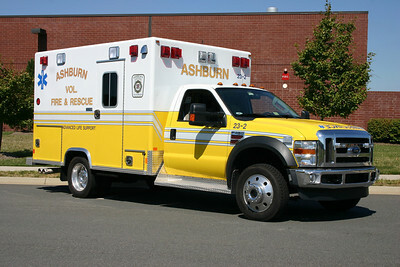 Former Ambulance 23-1, a 2002 Ford F-350 4x4/Excellance. Later became Ambulance 622-1. 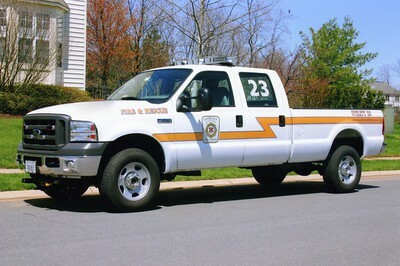 Former Utility 623 from Ashburn, a 2004 Ford F-350. 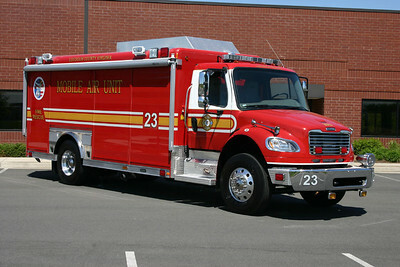 Sold in 2009 to the Remington VFD (Fauquier County, Virginia). 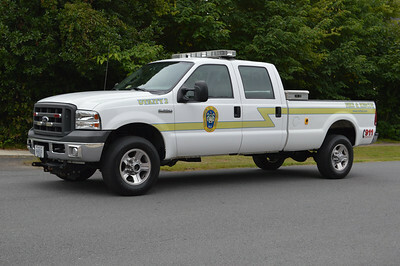 Utility 1102 is a 2004 Ford F-350 that was bought from Ashburn, Virginia.